Christmas dinners are bonding moments of families and friends, celebrating the gift of life. As Christmas Eve nears, many of us worry about what to prepare, or how much to spend for the occasion. Weight watchers also ponder on how much calories to take. Well, let me share with you this Paleo-friendly recipe that makes a healthy and sumptuous Christmas dinner. 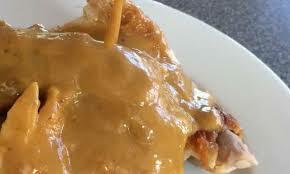 It’s the brined Turkey with gluten-free gravy. … and, here is how to prepare it. In a large pot and over low heat dissolve the salt. Let cool and then place in the refrigerator until completely cold. Remove the turkey giblets and set aside for other use. Rinse the turkey and place it in a large bowl. Add the brine and store in refrigerator for 8 hours. 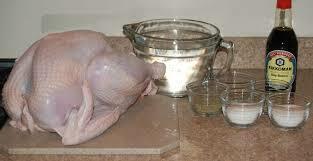 Remove the turkey from the brine and rinse it thoroughly. Pat dry. Place it on a wire rack over cookie sheet. Put it back in refrigerator uncovered. Leave dry for 6 hours. Take out the turkey from the refrigerator an hour before you roast it. Spread half of the vegetables in the roasting pan and add a cup of water. Stuff the remaining vegetables, herbs, lemon, and garlic into the turkey’s cavity. Truss the turkey with cooking twine and put it on a roasting rack with its breast side down. Glaze the turkey with half of the ghee and put it back in oven and roast for 40 minutes. Take the turkey out and turn it with the breast side up. Again, glaze turkey with the remaining ghee and return to oven for 20 minutes. Keep the turkey at room temperature for 30 minutes. Using a slotted spoon, remove the vegetables from the turkey and set aside. Separate some of the fat from the drippings. Put vegetables and drippings into a blender and puree until smooth. Put the gravy in a saucepan and simmer. Adjust seasoning according to taste. Don’t forget, though, that the essence of Christmas is not on the food but on the moments you share with your loved ones and family.